Easter is named after the Anglo-Saxon goddess of spring (Eostre), and is originally a pagan (non-Christian) festival. Eggs were used as symbols of fertility; this has led to traditions such as eating chocolate Easter eggs, egg races, egg hunts for children, and egg painting. The Easter bunny (baby rabbit) is also another symbol of spring and fertility. Easter weekend is now the time when Christians remember the death of Jesus Christ on a cross (on Good Friday), and celebrate his return to life 2 days later (on Easter Sunday). The date of Easter changes each year, but it is always between the end of March and the end of April. Note that both Good Friday and Easter Monday are public holidays in the UK. There are special Christian church services (the most well-attended are on Easter Sunday). For information about these, see: Ideas/Events/April. Churches are decorated with flowers, and many families also put flowers in their homes. People often buy chocolate Easter eggs for friends, family or for themselves. Sometimes they are hidden in a garden and children can enjoy an "egg hunt". Some people paint or decorate real eggs, although this tradition is more common in other European countries. It is common to eat "hot cross buns" at tea-time (mid-afternoon), especially on Good Friday. These are currant buns with a symbol on the top which represent the cross on which Jesus was killed. To serve: cut in half, toast, and spread butter on each half. Of course they can also be eaten cold if you prefer. People have four days off work (Friday to Monday), and students are also on holiday, so Easter is a very popular time to travel. Roads, stations, airports and hotels may be busy. If you want to go on a trip at this time, try to book it early. 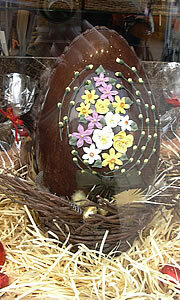 - Chocolates: Buy an Easter egg or other chocolate treats. Add someone's name on the front of an Easter card. Each letter will be added on an egg. Order flowers to decorate a home. People have four days off work or school (Friday to Monday), so Easter is a popular time to travel. For a list of organised tours during Easter, see: Travel/Tours/Dates. Try to book early, because these tours usually sell out quickly.